Best Fantasy and Science Fiction: Magic Kindgom for Sale--Sold! By Terry Brooks - FREE Download on Suvudu.Com! Magic Kindgom for Sale--Sold! By Terry Brooks - FREE Download on Suvudu.Com! "Magic Kindgom for Sale--Sold!" by Terry Brooks is now available as a FREE download in PDF, Kindle, Sony Reader, and Scribd formats via Suvudu.com! 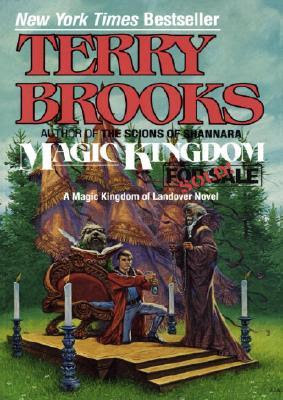 I recently started reading Terry Brooks' "The Magic Kingdom of Landover" series and I love it! At first I found it a bit too "kiddy" for me, but then it started evolving into a great world and a wonderful story. Funny enough, I havent read "Magic Kindgom for Sale--Sold! "and it's the first in the series! I apparently started at book number 3 and went forward. "After Ben Holiday purchased Landover, he discovered the magic kingdom had some problems. The Barons refused to recognize a king and the peasants were without hope. To make matters worse, Ben learned that he had to duel to the death with the Iron Mask, the terrible lord of the demons--a duel which no human could hope to win..."
If you enjoy Terry Brooks Shannara series but haven't had a chance to read any of the "The Magic Kingdom of Landover" series, I highly suggest you do! Immerse yourself in a fantasy world that with a little lighter atmosphere and some very memorable characters. I've never read anything by Brooks. I'm actually very resistent to funny fantasy. At least book length stuff. I read this series back when I was in HS... I loved it. Brooks is a great writer!